We came to Louisiana to sample the variety of offshore fishing available in the Northern Gulf, but #1 on our list was Yellowfin Tuna. The tuna fishery is strong and relatively reliable there, and we were fishing with the Mexican Gulf Fishing Company who have them pretty well dialed in. The winds had been blowing 20-30 for a bunch of days, so nobody had been out on the hunt, and this was the first day that it had laid down a little, so we were excited to get out after them. We met up at the marina at dawn and loaded a bunch of fishing gear into the Yellowfin 39 and a bunch of camera gear and crew into Captain Billy Wells’ boat and idled out. We came on plane in one of the many channels through the marsh and headed out towards the Gulf, passing by shrimpers, commercial fishermen and giant container ships on the way. Out in the Gulf we ran out about 10 miles passing a few rigs on the way stopping at another to load up on bait. 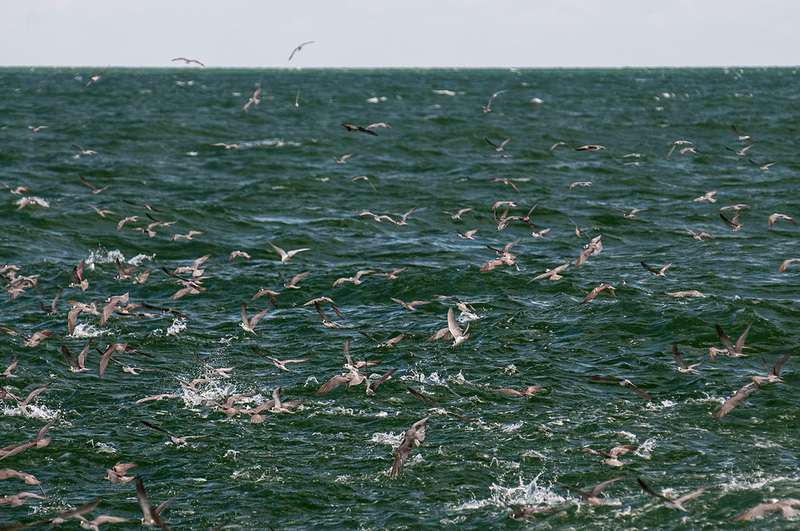 As we pulled up there were giant schools of blue runners just off the rigs pushing some sort of smaller bait to the surface where thousands of terns were dancing on the surface picking off the easy meal. It was an amazing sight to see. I guess these blue runners weren’t the right size for tuna, so Captain Wells set up the Yellowfin right up against the rig and Scott and Steve dropped sabiki rigs back pulling up doubles triples and occasionally a full pull of bait, filling up the livewell in a half hour or so. 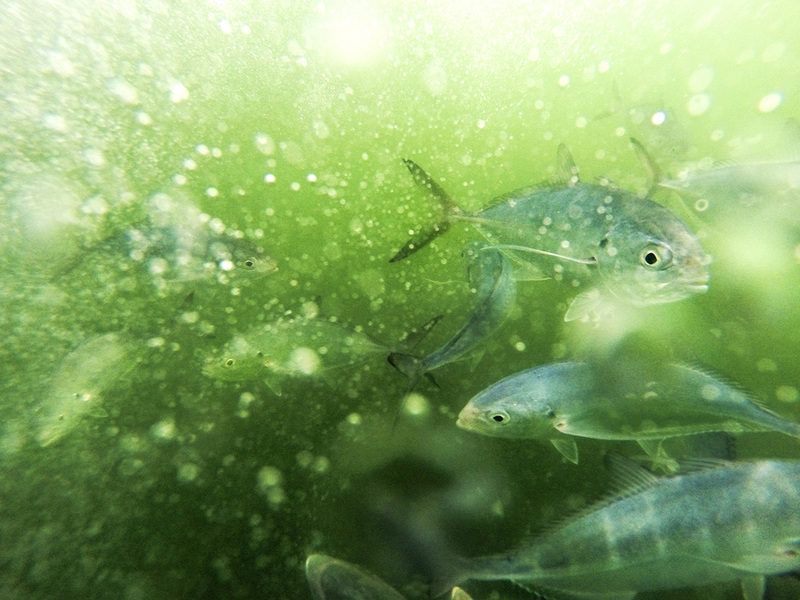 After shooting this for a little bit, I tried to get some underwater shots of the blue runners, with varied success. They were fast and wary of the boat, so my best shots came from casting a GoPro on a float rig that I built into the school and hoping for the best. Once loaded with bait, we set up to make a run out to a rig in deeper water that Billy thought could be holding tuna. The wind had laid down a lot but it certainly wasn’t slicked out, so the 45 minute ride was still pretty bumpy and the forecast was for the winds to ramp back up in the afternoon. Eventually, we arrived at a rig way out in a couple thousand feet of water and we began pulling out the camera and fishing gear. Steve and Scott threw out some live chum and dropped a couple baits back while Billy got on the radio and talked with one of his friends who had been working the area for a half hour or so. The report was not encouraging and after only 5 minutes, Billy wasn’t feeling it and made the call to move on. On the camera boat, we had just finished working out the kinks after the long bone jarring ride and were not thrilled when we got the call that it was another 27 miles to the next spot. So we locked down the gear and settled back in for another 45 minute run. Finally, we arrived at our fishing location, the Stena Forth, a huge mobile exploratory drilling ship that had been testing the bottom for oil in 5000 feet of water for over a year in this spot. Almost immediately, we started marking bait and fish on the Simrad and the first few handfuls of freebies tossed out the stern led to impressive surface explosions. Baits were quickly dropped back and it didn’t take long for a nice double of Yellowfins to be hooked up. After 10-15 minutes Steve had brought his fish to the boat where it was gaffed, but Scott’s had a few more pounds on it and took a little longer. Eventually both fish were lifted on board and things were looking up. The double had taken us down current alongside the Stena Forth, so we idled back to our initial location off the Stern of the rig and started live chumming again. This time Billy and Scott dropped baits back and Steve started hucking a new topwater Orca plug they had received from Shimano. Billy was first, making quick work of a nice tuna, even though he said he hadn’t had the chance to actually fight one himself in a long time. After that Scott and Billy doubled up, while Steve continued to throw the topwater plug hoping for the big explosion. Once both Billy and Scott’s fish were landed they heading back to the spot and everybody started throwing topwater. This time Steve and Scott doubled up on top, but Steve’s fish was a bonita and came in quickly. Eventually Scott got his topwater fish to the boat and Steve gaffed it and they put it quickly on ice with the others. It was starting to get a little late in the afternoon and as promised, the winds and waves were picking up. We decided to pull back up to the spot one more time and toss out the rest of the freebies for one more try. As before the live chum led to big blow ups a ways behind the boat. Steve continued to bomb them with the Orca plug and was finally rewarded with the big bite he had been looking for. Once more we drifted down with the fight alongside the Stena Forth and Scott stuck the big fish as Steve worked it to the boat. As they pulled it aboard you could just see the tip of the plug sticking out of its mouth. With that last fish we called it a day, with a long bumpy ride home and a lot of tuna to clean back at the docks.